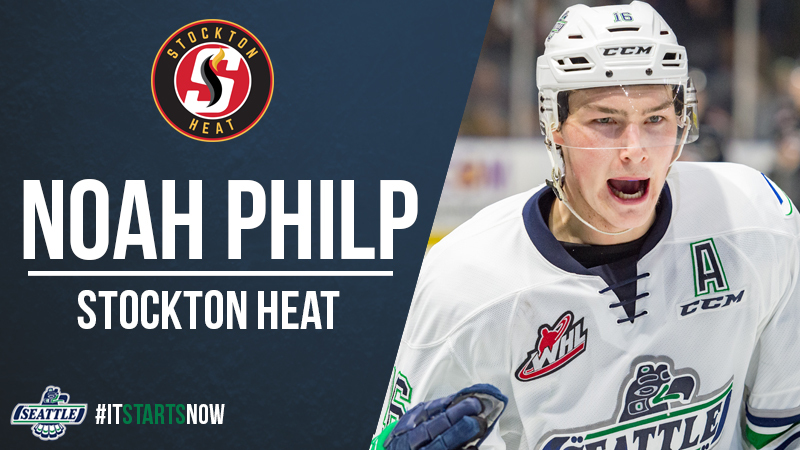 KENT, April 2, 2019 — Seattle Thunderbirds general manager Bil La Forge today announced center Noah Philp has joined the Stockton Heat of the American Hockey League on an amateur tryout agreement. “Noah joining the Heat also shows the hard work of our Coaching Staff and Player Development staff, especially Steven Goertzen, who worked with Noah all season to help improve all aspects of his game,” continued La Forge. Philp had 26 goals and 49 assists for 75 points in 59 games this season. In 259 career games over four seasons with the T-Birds and Kootenay Ice he had 54 goals and 112 assists for 166 points. Philp was acquired from the Ice on September 11, 2017, for a fifth round pick in 2018 and a fifth round pick in 2019. The Heat have back-to-back games against the Manitoba Moose on Saturday, April 6, and Sunday, April 7, in Manitoba. It is possible Philp could make his professional debut in one of these games. The Heat are the AHL affiliate of the Calgary Flames. Season Tickets for the 2019-20 season are currently on sale. Season tickets can be purchased by calling the T-Birds office at 253-239-7825.